Finally, a credit card option tailor-made for therapists. Ivy Pay makes it easy for clients to put a card on file, so you get paid. Take payment with a push of a button — you can charge the client's debit, credit, HSA or FSA card on file. Less hassle than cash, checks and dealing with swiping or readers. Direct deposits sent right away and arrive in your account as soon as the next day. Ivy Pay's HIPAA-secure design is guaranteed with a signed Business Associate Agreement so you're fully compliant. Therapists all across the country trust Ivy Pay. You just push a button and then you’re done — there’s no dealing with checkbooks or a reader. It’s so easy to get clients signed up. All my clients are on Ivy Pay and want to keep using it. 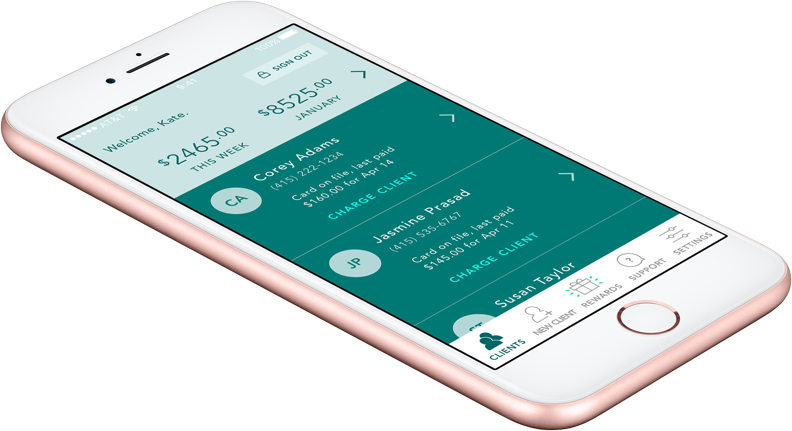 A client recently told me at the end of session that using the app makes things much easier and that she is glad she doesn't have to bring her checkbook or take out her card. Thanks Ivy Pay for enhancing my clients' experience. "Swiping my card at the end of every session is a total hassle, with Ivy Pay it’s so easy for me to pay my therapist." "It’s so easy. I don’t have to bring my checkbook anymore. My therapist was the only person I wrote checks to." Ivy Pay is perfect for the solo practitioner, who, like me, manages all payments and billing. My clients love being able to put their cards on file. I have found Ivy Pay immensely useful. Clients love it because it’s quick and easy. The service is smooth and painless. No swiping. No traditional markup. Ivy Pay only serves qualified, licensed therapists so you enjoy a low, no-swipe rate without the traditional 33% no-swipe markup. Get the Ivy Pay app on your iPhone or Android. Get the free Ivy Pay app. been sent to your phone.